Thank you for visiting our web site. We trust you will enjoy your visit and review the helpful information. Tune In the month of April on the Folk Channel as Pastor Mike shares a message entitled "He is Risen." This Ressurrection season, join Pastor Mike as he shares fresh revelation from God's word and anointed Gospel music. click below then click on "more"
MVM/Good News Fellowship Church, 13101 HWY. 442 W. Tickfaw,La. will be welcoming The Barber Brothers for their 50th Anniversary Music Ministry Celebration/ There will be many guest appearances. Admission is free. An offering will be received. For details about our concerts visit the calendar page. Traveling from out of town to one of our concerts or church services? Request a free Tangipahoa Tourism Visitors Guide. It's loaded with hotel & campground information. 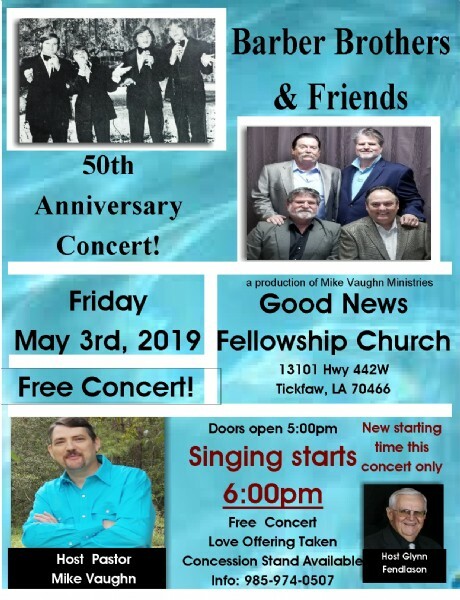 Many of them are very close to the Church.If you are staying a few days, there are a lot of nice things to do and see in Tangipahoa Parish and surrounding areas. Our Host hotel is the Hampton INN Hotel located at 401 Westin Oaks Dr. Their # is 985-419-2188 Visit the contact us page for MVM phone# or email address and a map of our location.
" Out Reach Ministries Page"
we trust that you will visit us soon. on Interstate -55. See map on contact page. Consider becoming a partner with Mike Vaughn Ministries and receive a special letter from Mike Vaughn each month and special product offers.For more information visit the MVM partner page on this website. Visit our friends at INTERNATIONAL COWBOY CHURCH ALLIANCE NETWORK . This is how to get to our page- On the home page, top left hand corner, click view all members, then type" Mike Vaughn" in search box, then click on Mike's picture. You can listen to Mike's songs and view the pictures and information. 3.Believe that Jesus died for you on the cross and rose from the grave. 4.Through prayer invite Jesus to come in and control your life. Eph. 2:8,9 If you would like more information about how to be saved or you are seeking for truth ,call us or email us for free literature. You can listen to the Good News Radio Program on the Web! See our Outreach Ministries Page to view times.